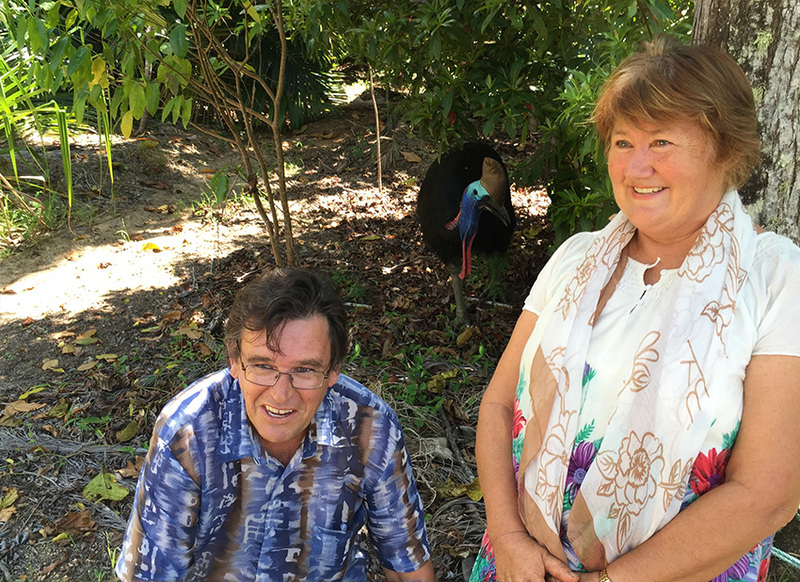 Geoff Onus and Carolyn Emms from Rainforest Reserves Australia celebrate the agreement with a local cassowary. Photo: Liz Gallie. 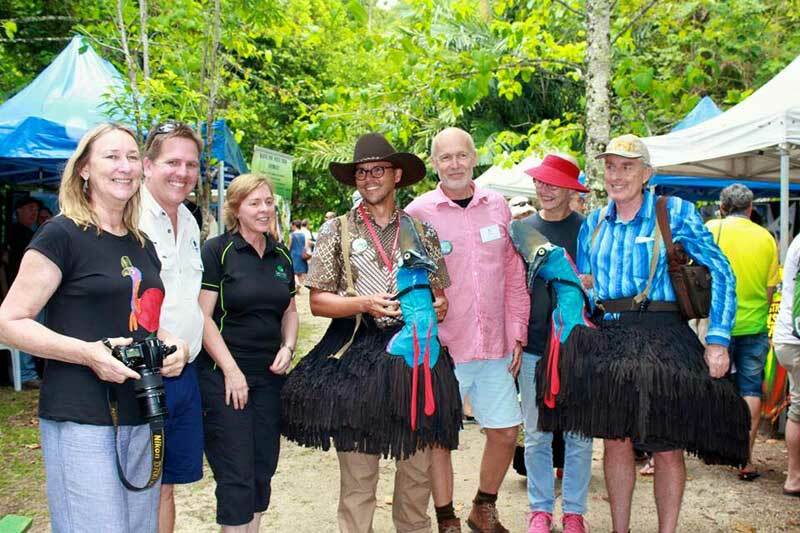 On 31 March 2016 Mission Beach residents helped to celebrate a new agreement to operate the local cassowary rehabilitation centre at Garners Beach. Since July 2105 EHP has allocated $80,000 to upgrade facilities at the rehabilitation centre and to allow the centre to continue operating. 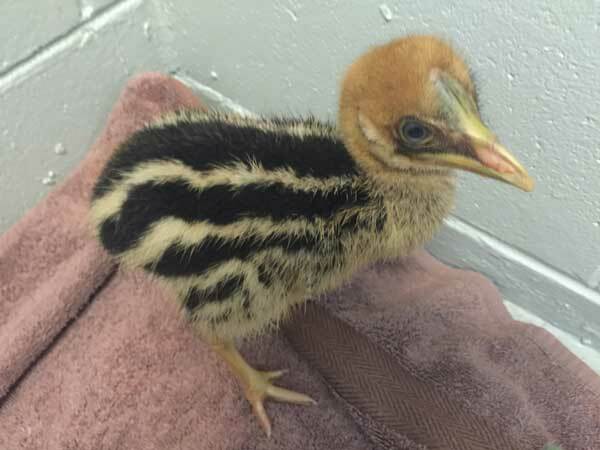 The centre can now accept adult cassowaries as well as chicks. 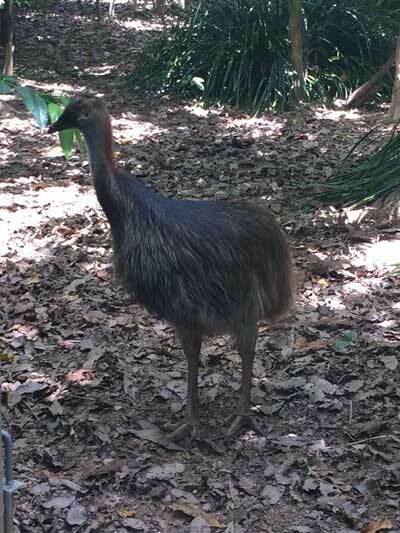 Environment Minister Dr Steven Miles said that the Department of Environment and Heritage would continue to be the initial contact point for members of the public reporting cassowaries in need. EHP has specially trained wildlife officers who are ready to provide first responses to reports of cassowary incidents. As part of the agreement Rainforest Reserves Australia will also work to establish a second cassowary rehabilitation facility at Lake Barrine on the Atherton Tableland. Lindsay Delzoppo, Director of the Wildlife Management Unit (EHP), gets to know a local cassowary. Photo: Liz Gallie. The southern cassowary has been added to the list of 20 birds which are identified as a priority for conservation under the Australian Threatened Species Strategy. In July 2015 the strategy set out the Australian Government’s plans for action to protect and recover Australia’s threatened animals and plants. It included commitments to improve the trajectories of 20 threatened birds and 20 threatened mammals by 2020. Twelve birds and twelve mammals were identified at the launch of the strategy. On 22 January 2016 the Minister for the Environment, the Hon Greg Hunt MP, announced the remaining eight birds and eight mammals, including the southern cassowary and mahogany glider from the Wet Tropics of Queensland. These additional 16 threatened species were identified through expert input and consultation with the scientific community, and through consideration against the Principles for Prioritisation in the Threatened Species Strategy. You can download a copy of the factsheet for 20 birds by 2020 here. It includes short summaries about the eight birds recently added as priorities for conservation. Three chicks who have been residents at Garners Beach Cassowary Recovery Facility during 2015 were released back into the wild in late November. Small tracking devices have been attached to the young birds. Dr Hamish Campbell and Dr Graham Lauridsen will be running a three year tracking project to see where the birds roam and how long they survive. The tracking devices are small, placed on the back of the cassowary’s neck, and the batteries last between three and five years. The birds will be tracked from a transceiver located in the bush near the release site in Hull River National Park south of the river. The transceiver has a range of about five kilometres. Local residents will also be on the lookout any birds with the tracking devices if they travel further afield. There have also been some new arrivals at Garners Beach in the past month. World Cassowary Day was held on Saturday 26 September at Mission Beach. Over 40 organisations set up stalls at the C4 Environment Centre and in the adjacent arboretum. After some heavy rains early in the day, the weather fined up and the visitors flowed in all morning. Special guests included Gregory Andrews, the Threatened Species Commissioner, Bob Irwin, Julia Leu the Douglas Shire mayor and Bill Shannon, the mayor of Cassowary Coast Regional Council. 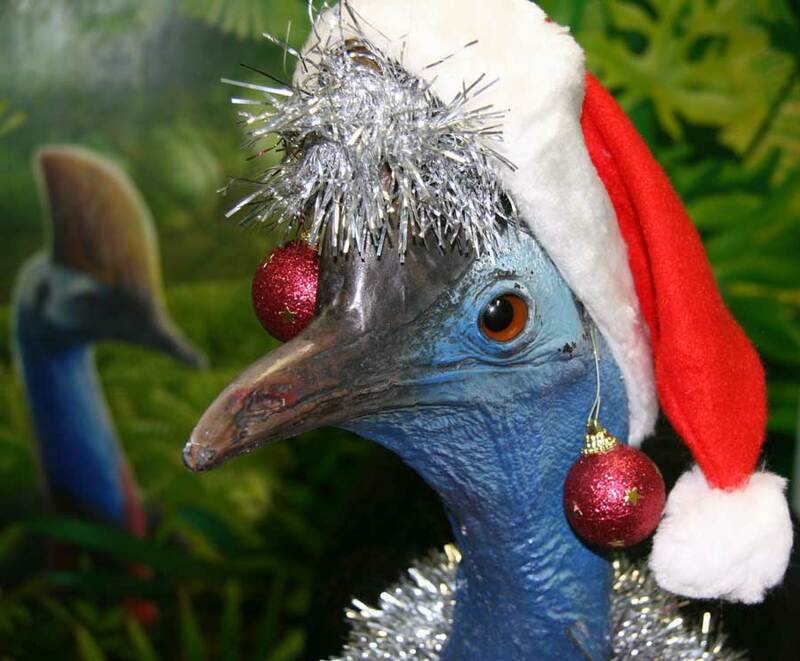 You can see all the pictures and activities and stalls at the World Cassowary Day website. The 2016 World Cassowary Day celebrations will be held in the Daintree. Many thanks to the organisers and all those who participated, in particular C4 (Community for Cassowary Conservation), Mission Beach Cassowaries, Terrain NRM, Kuranda Conservation and ABC Far North.